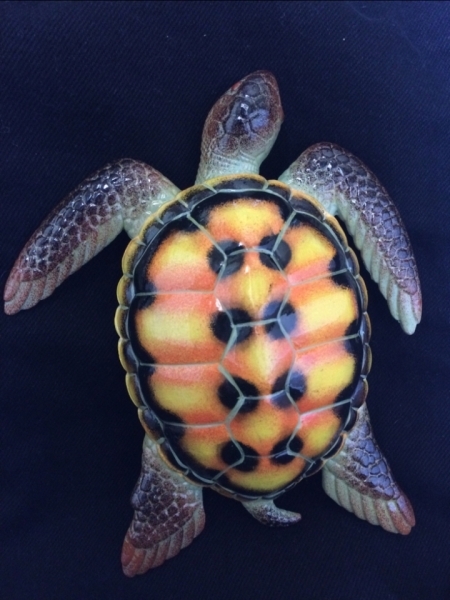 Each of these Sea Turtle Sall Statue pieces is hand painted and unique. There are 2 sizes available, 16" by 12.5" and 8" by 6.5". There are 6 colors for each style. You can pick out the same colors for the same size turtles or combine different colors and different sizes. Your choice from this selection will be truly unique and you will make an exceptional design accent for your home or office. Note: Due to each of these pieces being hand painted and unique, there may be variations in color from those in the images. Fiber glass, 8 inches W. x 6.5 inches H.